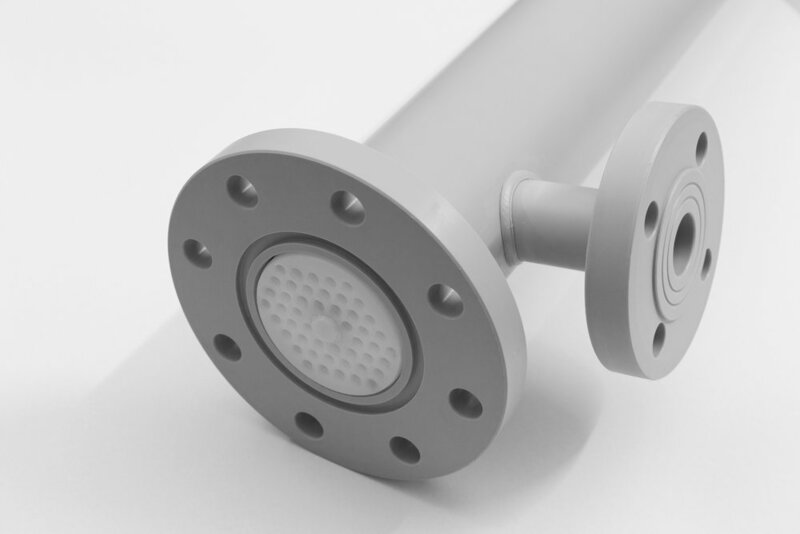 MICRODYN® tubular & capillary microfiltration modules are a modern filtration method for the separation of suspended particles or emulsified liquids. The highly porous symmetrical structure of the MICRODYN polypropylene membrane leads to high permeability rates. The MICRODYN membrane is available in 0.1 and 0.2 micron options, with a very narrow pore size distribution to allow for sharp separations. The MICRODYN membrane is very resistant to abrasion and other mechanical damage due to its homogeneous construction, unlike asymmetrically structured ceramic membranes. The chemical resistance and pH resistance (0 - 14) of the modules is unmatched due to the polypropylene membrane material. SEPRODYN® crossflow microfiltration modules are used to separate suspended solids larger than 1.0 micron. The highly porous polyethylene membrane is backwashable, allowing for stable and efficient filtration with continuously high product flux. The smart construction techniques employed in the module manufacture allow them to be used in applications which require highly stable polymer materials, pH stability (0 to 14), and high resistance against abrasive substances. Feeds with a high solids content are not a problem for SEPRODYN® due to the self-supporting and extremely robust tubular membranes with a large inner diameter of 5.5 mm. These tubular membranes are made of ultra-high molecular weight polyethylene, in a process patented by MICRODYN-NADIR. High mechanical strength, backwashable membrane in a wide range of membrane types make ULTRADYN™ hollow fiber modules suitable for all applications requiring a high level of purification and high packing density. ULTRADYN modules are available with polyethersulfone (PES), polyacrylonitrile (PAN) and cellulose tri-acetate (CTA) hollow fiber membrane types. Additionally, ULTRADYN hollow fiber modules is avilable in configuration that can be sterilized with hot water up to 98 °C, eliminating bacterial growth and preventing fouling. The compact and lightweight MAXIDYN™ tubular modules are best suited for filtering solutions with high levels of suspended solids. These modules are available with polyethersulfone (PES) or polyvinylidene fluoride (PVDF) membrane and with a variety of molecular weight cut-offs (MWCO). Flexible treatments options are possible with MAXIDYN modules - the tubes can be arranged in parallel or series in the MAXIDYN tubular modules depending on process or system requirements. Designs in series are best suited for low feed volumes, while parallel designs allow for treatment of solutions with a high fouling potential. With ready-to-mount connections and a simple design, MAXIDYN offers a plug and play treatment solution with quick and easy installation.